Jon Huntsman and Ron Paul hope to win the state’s much-hyped bloc of independents. Too bad it doesn’t exist. 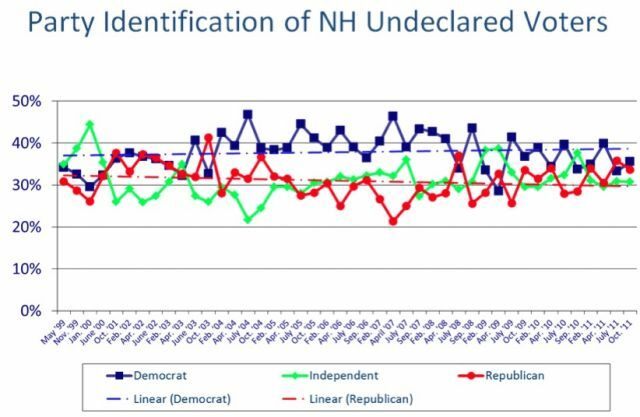 Each election cycle, scores of political stories trump up the need to woo these undeclareds in order to win New Hampshire. This time around, Republicans Jon Huntsman and Ron Paul in particular have been courting these supposedly independent, contrarian voters. They may be recalling how John McCain shook up the 2000 GOP presidential primary with an upset win in New Hampshire, in part thanks to big support from independents. Smith’s polling data also shows that undeclared voters have grown more Democratic in the past decade. In 2000, 37 percent of undeclareds identified with Democrats, and 32 percent identified with the GOP. He adds that these voters aren’t as crucial as candidates and reporters make them out to be, because they tend to be less zealous. He describes them more as “apolitical”; they don’t vote as often in elections as New Hampshire citizens affiliated with a political party. Dennehy speculates that there could be a surge in turnout among undeclared voters in Tuesday’s primary. That’s not because undeclared Democrats will decide to vote Republican, he says, but instead because the field of Republican candidates is so large. In 2000, for example, undeclareds had only two candidates, McCain and George W. Bush, to choose from in the GOP primary. In Dennehy’s view, that’s especially bad news for the moderate Huntsman, who has bet all his chips on a strong showing in New Hampshire. He’s unlikely to win over dyed-in-the-wool Republican voters (who will be inclined to vote for Romney) and therefore needs big majorities among undeclared Republicans and true independents.